I believe I put this out there in another post, but I think it bears repeating: “The Mentalist” is the new series that my mother-in-law is the most excited about. I can appreciate where she’s coming from. I’m pretty excited about it, too. Mind you, my reasons are different than hers – I love the concept, she thinks the show’s star, Simon Baker, is hot (and has apparently felt this way since he starred in “The Guardian”) – but, still, it means that I can count on her getting excited when I get an advance screener of any future episodes of the series. In “The Mentalist,” Baker plays the title character. 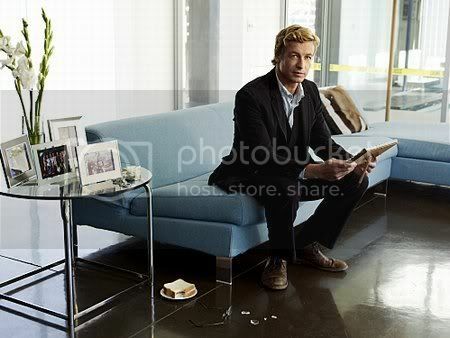 His name is Patrick Jane, and he’s an independent consultant with the California Bureau of Investigation (CBI) who has a remarkable track record for solving serious crimes by using his razor sharp skills of observation…not that that’s a direct quote from the CBS press release or anything. Jane is a guy who knows how profound his abilities are, and it shows in his every word and deed when he’s on a case. I won’t tell you how the rest of the scene plays out, but it’s a testament to Baker’s charisma that his last line – “Honestly, it’s not as bad as it looks” – earns a laugh.